I don’t know of a single tabletop player that hasn’t done some house rules, a home brew or create something from scratch. One of my house rules that gets written into Every RPG that I run is, “Players win all ties,” meaning rolls vs. NPCs or the Game Master. The first time ever tried to write my own game, not design a dungeon, I used the TSR Star Frontiers Alpha Dawn rules to run a game based off of the alien invasion television series V.
I know several peoples that have written their own games, setting and or system from the ground up. John Grana (of the Fear the Boot podcast) published his Bloodmoon Goblins supplement for the Pathfinder rules; Chad Watler (also of Fear the Boot) is an Ennie Award winning game designer whose work can be found at Morning Skye Studios. These Booter guys get around as Dan Repperger is working on publishing his own game Skies of Glass which has an actual play that is a kind of running play test. Personally I have extensively play tested the indie Century’s Edge written by my friend Louis Hoefer who also wrote a heavily homebrewed Transformers Third Edition game. I have been banging around an idea for years for a Green Lantern RPG game but never could wrap my head around it. GL has been addressed in various ways in the three DC Comics based RPGs; DC Heroes by Mayfair, DC Universe by WEG and the more recent DC Adventures from Green Ronin; and I haven’t been satisfied with any of them. The Green Lantern Corps often seems an afterthought instead of the bigger treatment that that it deserves. This brings me to G.I. Joe: A Real American Hero. My primary toy lines that I was a HUGE fan of were Star Wars and the Joes. There are RPGs out there on the interwebs and “knock offs”… however I know what “feel” I want this to have and I know what I want so why not write it myself? Or home brew something myself as writing from scratch doesn’t seem viable at this time. The literal Generic Universal Role Playing System aka GURPS? I rather enjoy the system and it can be as crunchy or as light as the players and gamemaster require. There are so many excellent sourcebooks out there and many that can be had On The Cheap. The other generic system is of course Savage Worlds. I ran a rather silly creepy zombie kids game set at the Indianapolis Children’s Museum. And yes the rules, as written for Shaken in SW are ponderous and often are House Ruled by Every Person who has ever ran this game. 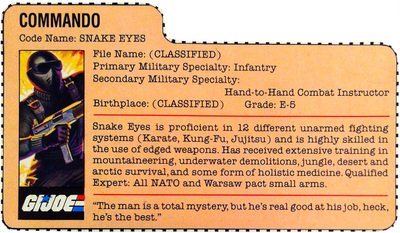 I want that nostalgic feel of the Larry Hama written Marvel Comics, of the file cards that were on the back of each action figure, and a little dash of the syndicated cartoon. The movies were fun, ok the first one was fun I hated the second but more on those some other time. SW is very quick in set up, running and doing most anything on the fly; GURPS has something for everything in one form or another and is pretty quick to run as well. SW it is with a little help from GURPS. I have absolutely no license for this and will not profit, anything I come up with I will release for free, the game ideas are mine and the characters and all of that are all HASBRO. I have already been working on it in very small increments, creating a few pre-existing Joes as a playtest.. I want to incorporate the features on File Card such as Primary and Secondary Military Schools, the Qualified Expert weapon training and the flavor text about the characters in the design. Why all of this word salad about games and game design and my fangirling over G.I. Joe? You can’t have written something if you haven’t written something. After a conversation that I had over the weekend with someone who was very prescient in what they said, they confirmed what I was already thinking. Fear of success is not the issue, laziness is an excuse; creating is the issue, publishing or releasing it is the issue. You can’t be sullen over output if you never put out. I have used that excuse, a lot. I won’t have this done in time to submit it for Gen Con 2018; you have to submit months in advance. I don’t want to set myself up for failure, but in time for the actual con and maybe run it for some friends at GenCon 2018? That’s the deadline for what I am calling Wave One, a G.I. Joe RPG consisting of that first wave of action figures and vehicles.